Azure River has revived its 2014 SummerWorks hit Madam Mao. It’s a play that will certainly spur any viewer to learn more about one of the most powerful women of the last century, a woman too little known in the West. 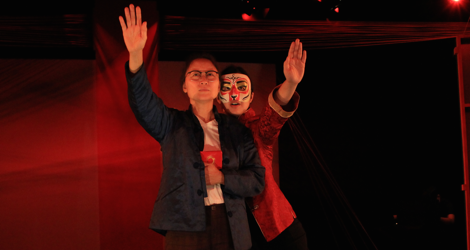 Combining film, dance, song, clown and theatre, the play aims primarily to formulate the paradoxes embodied by the fourth wife of Chairman Mao Zedong. This focus also allows the collective who wrote the play to examine how it happens that a revolution meant to free a people ends up by enslaving them. The play is set in a jail cell in Beijing in 1991. By this time Madam Mao (1914-91) had been imprisoned for twenty years after being convicted of “counter-revolutionary activities” when she was part of the Gang of Four, who were the de facto rulers of China in the last years of Mao’s life. 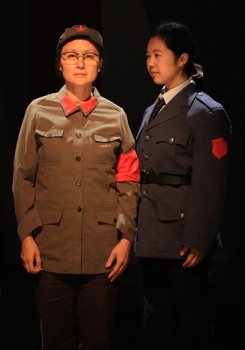 Throughout the play she is called Jiang Qing, one of at least eight different names that she used during her life. This particular name is important as the one she adopted when she joined Mao’s Revolution. China is now ruled by Deng Xiaoping (1904-97), who engineered China’s brand of state-sponsored capitalism. Deng wants Jiang to make a public confession of her guilt for all the crimes she committed during the Cultural Revolution to put a definitive end to that period and thus bolster his own regime. A young Sergeant (Samantha Wan) has come to take down Jiang’s confession, but Jiang is unwilling to give it. A battle of wills ensues between the sergeant and Jiang interspersed with flashbacks wherein Jiang recalls key events of her past. centre of the Chinese Communist Party. Jiang became romantically involved with Mao, who at the time was still married to his third wife. The Party allowed Mao to divorce his wife and marry Jiang, provided that she remain out of politics for thirty years. Jiang abided by this restriction but once the thirty years were up she became instrumental in the Culture Revolution and in setting up “re-education camps” for those who still held “reactionary” ideas. As part of the Central Cultural Revolution Group she urged the Red Guard to attack the”Four Olds” – old customs, old culture, old habits and old ideas – which led to book burning, the raiding of museums and the destruction of temples and shrines. Jiang also used the Red Guards against her own political enemies. Ironically, given her past as an actor, Jiang herself ordered theatres closed and allowed the Peking opera to perform only eight new works known as the “Eight Model Plays”. These included the ballet Red Detachment of Women (1964), a précis of which is performed as part of the play by Wan and Amanda Zhou. What emerges is the portrait of a woman who rose from nothing to supreme power and looks on her former power as a privilege. Her arrogance is mingled with fury that the new regime is using her as a scapegoat, since it dare not tarnish Mao, for the failures that occurred under Mao’s regime. At the same time Jiang knows that her love of Mao, as replayed in her first meeting with him in Yan’an, was the primary motivation for her actions. This, too, is tinged with bitterness since Mao, contrary to his avowed egalitarian view of the sexes, did not choose her as his successor. All this complexity of emotion Janet Lo conveys in a subdued performance that burns with a growing fire allowed to break out only near the end. Wan has the widest range of acting styles to perform. She is the Sergeant who interrogates Jiang and demonstrates that the new regime is at least as imperious as was the old one. Wan also performs the role of a clown-like trickster figure, the Monkey King. As the trickster she comically manipulates Jiang to make us see physically how the new regime is manipulating Jiang’s reputation. Wan also is equally adept as as a dancer. Amanda Zhou takes the main role of Wu Qinghua, the central character of Red Detachment of Women who sees the futility of personal revenge against those who wronged her. In the play this character becomes a kind of idealized version of how Jiang sees herself. Not only does Zhou dance with beautiful poise and fluidity but she also sings beautifully. Director Severn Thompson melds the multiple elements of the play deriving from disparate media into a satisfying whole. Heidi Chan’s live music is central to creating the changing moods of the piece. One cannot expect a 70-minute-long play to cover the entirety of such a complex historical figure, but Madam Mao will have fulfilled its goal if it makes us more aware of the importance of its title character and makes us long to learn more about her. Madam Mao opens a door onto a major part of 20th-century history of which we dare not be ignorant. Photo: (from top) Janet Lo as Madam Mao and Samantha Wan as the Trickster; Janet Lo as Madam Mao and Samantha Wan as the Sergeant. ©2016 Rainy Fresh Pictures.